Cooking meals while living the van life isn’t as difficult as you may think, but it’s not going to be the same as what you’re accustomed to. You won’t be forced to eat Clif Bars and nuts every day, but you will be limited in the way that you cook certain foods, and you will need to be a bit more strategic with your shopping trips. With a fridge/freezer and an electric or propane stove, you can have some healthy and delicious meals. A propane stove or oven is a great option for camper vans and conversion vans. You can buy cheap small propane canisters or buy a larger standard size propane tank with an adapter to power your cooker. Propane stoves are great because you can use them inside or outside of your van, and you don’t need to worry about using up any of your electrical power. The only downside is the cost of propane will add up over time. 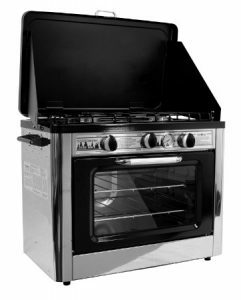 The Camp Chef Oven is for really great cooker perfect for anyone looking for a bit more power and sophistication. 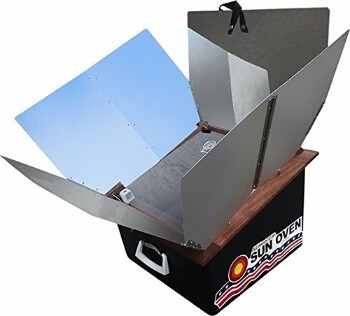 It comes with a matchless igniter, a built in oven thermometer, and a collapsible lid and protectors on the side so grease doesn’t splatter around your van’s countertops, or if you’re using it outside it protects against the wind blowing out your flame. It also has independently adjustable burners, along with a removable grate and oven racks. The Coleman Propane Stove is very affordable and one of the best stoves for a campervan. Just like the Camp Chef Oven, this stove also comes with a collapsible lid. It’s super lightweight, easy to use, and we’ve had success using this stove both inside and outside. This camper van stove also has two independently adjustable burners and a removable grate for easy cleaning. 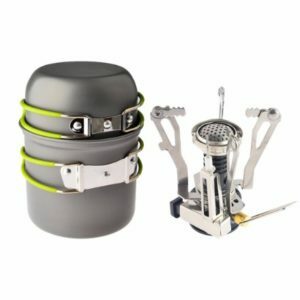 This stove is super portable and easy to store in your van or backpack. This is great if you go on all-day hikes and need to fire up some lunch. It’s made from non-toxic anodized aluminum, making it extremely durable. It also has an easy to use matchless igniter. The only downside is it’s small so you’re limited in the amount of food you can cook and the types of food you can cook. However, if you get creative you can cook almost anything in this little stove pot. 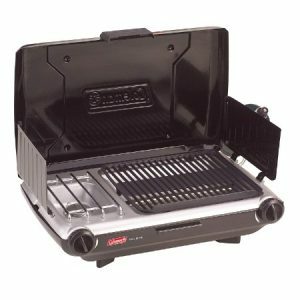 If you absolutely love to grill, you may need to get yourself a Coleman portable grill/stove. 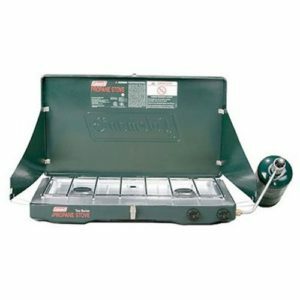 It has wind blocking side panels that also fold down to use as side tables, along with 2 independently adjustable burners, and a removable grease tray for easy cleaning. Electric cookers are a great option for camper vans with solar power. Propane tanks aren’t too expensive, but they can add up over time, making electric cookers the much more affordable cooking option in the long run. The downside to electric cookers is it’s difficult to take them outside of your camper van to cook. The only easy way to do this is by having your cooking/kitchen setup at the back of your van facing the rear. Some van dwellers have installed drawer runners so they can slide their cooker farther outside of their van – you can check this out in our Kitchen Chapter. If you decide to stick with cooking inside, you’ll want to at least crack a window, but preferably open a door. 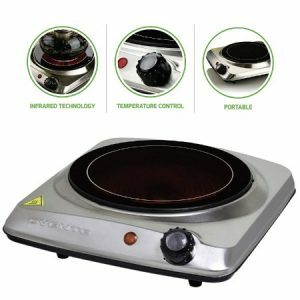 The Secura Induction Cooktop is a highly recommended option for campervans as it’s equipped with 15 power levels ranging from 200 to 1800 Watts and temperatures ranging from 140 degrees F to 460 degrees F. It has a digital control panel with a built-in timer, along with auto-pan detection and a high voltage warning system. Since it’s an induction cooker, it’s only compatible with certain pots and pans such as cast aluminum enameled iron and steel, stainless steel with a magnetic bottom, or cast iron. If you’re not familiar with how induction cookers work, they use electronic magnetic induction to produce heat, which is great for a number of reasons: They heat up much quicker, they’re more energy efficient, and they don’t get hot unless you place a pot or pan on them because they don’t use traditional radiant heat. To see if your cookware is induction capable, grab a magnet and if it sticks to the bottom of the cookware, it will work with an induction cooker. 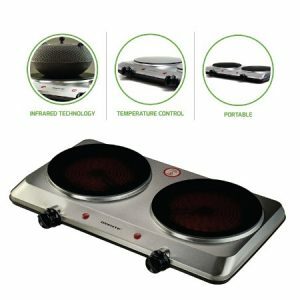 The Ovente Countertop Burner is an infrared burner so it works with all cookware. 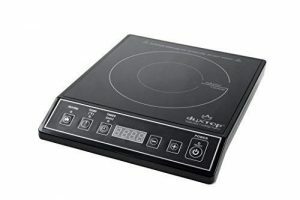 It’s a bit more affordable than the Secura Induction Cooker and it works great, but it only has the basic features and won’t be as energy efficient as an induction cooker. This is the same cooker as the one above, it just has 2 burners each with independently adjustable burners. The Sun Oven as you can probably guess uses the sun as power. It’s not cheap, but since it uses the sun it’s more affordable in the long run, environmentally friendly, and works quite well. On a great day, it can reach up to 400 degrees Fahrenheit. Eating raw foods will cut out the need to cook as many meals, and is healthier in many cases. Cooked foods tend to destabilize enzymes, kill vitamins and antioxidants, and are more difficult to digest. Raw foods will include fruits, vegetables, nuts, seeds, extra virgin coconut or olive oil, and raw yogurt, to name a few. To give you some extra space in your van, you can make fruit and veggie smoothies. If you are really cramped for space, you may need to start eating foods that take up less space in your van or go shopping more frequently. Small or dense foods that are high in calories are typically going to be foods higher in fat. Living in nature will hopefully cause you to be more active so you can get away with eating a few more calories! Unfortunately, we are not chefs. 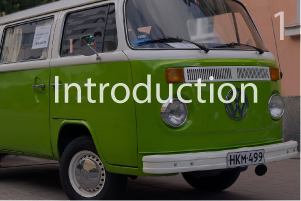 Here are some websites with camper van friendly recipes that we turn to for inspiration! 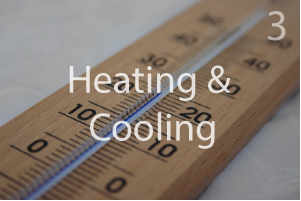 When it comes to keeping your food and drinks cold, you have two options: an electric refrigerator/freezer or a standard cooler. If you decide to go with a standard cooler, you will need to grocery shop often and keep your ice stocked. You can usually get ice for free or really cheap if you bring your own container to fill up at a gas station soda dispenser. With a powerful electric fridge/freezer, you won’t need to worry about eating your food really quickly or going to the grocery store on a daily basis. You can travel out in the middle of nowhere for days on end and still be able to eat your favorite ice cream. Electric refrigerators can range from a few hundred bucks to over one thousand. Refrigerators such as an ARB can get pricey, but the technology and features are astounding. With an ARB fridge, you don’t need to worry about your car battery dying, because it shuts off automatically when it senses the battery getting low. It also plugs into the cigarette lighter in your van and a standard AC socket in your home as well. Not to mention the front-mounted control panel with an electric temperature setting. Check out our article on the Best Camper Van Fridges. 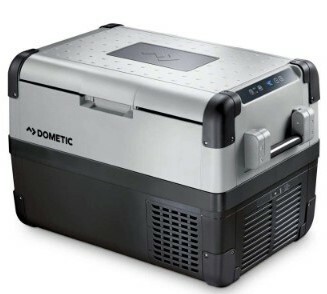 Dometic CFX Portable Fridge Freezers (from 26 to 90 quart capacity) – the Dometic CFX fridges are some of the best fridges on the market. They’re incredibly efficient, long-lasting, and still pretty affordable. 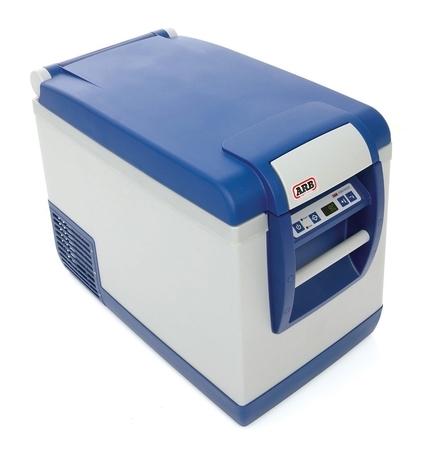 ARB Electric Freezer Fridge (from 37 to 82 quart capacity) – ARB also makes some really great portable fridges. They not quite as efficient as the Dometic fridges, but they’re still in the top tier. They’re known for being long-lasting an incredibly durable. 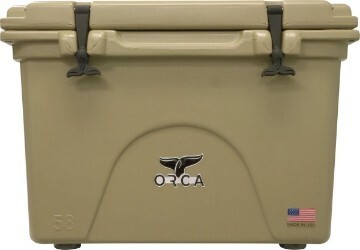 ORCA Cooler 58-Quart – this ORCA Cooler is one of the top-rated coolers, and for a good reason. It’s expensive, but its integrated insulation keeps your food fresh for up to 10 days. 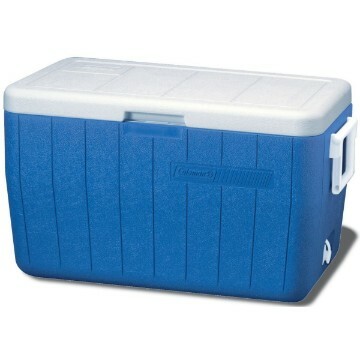 Coleman Cooler 48-Quart – this Coleman cooler is very affordable and still pretty effective, keeping ice frozen for up to 3 days. Grocery/Dollar stores – Our friends @travelingtuttles often get their water at water-filling stations outside of grocery stores. Some grocery and dollar stores have vending machines that let you fill up your jugs for very cheap. Campgrounds – Our friends @runksy often use campgrounds and motorhome stops to refill their water tanks. Gas Stations – many gas stations will have water access. Parks – Many city, state, and national parks will have areas to fill up. Rivers and Lakes – If you have a quality water filter, this is a good option. Rest stops – In some states, public rest stops will have water taps for you to use. Friends/Family – If you have friends or family nearby, you can ask to use their hose to fill up. Private residents – If you’re desperate, you can ask strangers if they will allow you to use their hose to fill up. You may need to fork over a few bucks with this strategy. Be careful in some areas of the country, as trespassing can get you in some trouble! Tip: Bring your own hose because most places will not provide one. When using a hose from an outside tap to fill water tanks for drinking water make sure you use the white, food grade hoses that can be bought from any store with RV supplies. Don’t use regular (normally green) garden hoses as they can leak lead over time, potentially making the water toxic. Tip: If you’re traveling to a country with unsafe drinking water, be sure to have it purified. Our friends @vantacruz_ and @d_bus_life have traveled through Mexico and found purification stores or “agua purificada.” It is an extremely cheap and simple process. You simply bring the container you want filled and they do it for you on the spot with filtered water. A 25 liter container usually costs around 10-15 pesos to fill (less than 1 dollar). Some purification stores also can connect your hose to fill your bigger fixed tanks. CamelBak Chute 40oz Vacuum-Insulated Stainless Water Bottle – the double wall vacuum insulation will keep your beverages cold for 24 hours and hot for 6 hours, no matter what the weather conditions. 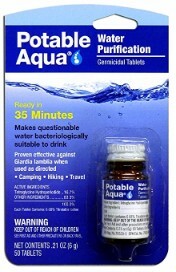 Potable Aqua Water Tablets – these tablets will turn funky water into drinkable water. However, these should only be used in emergency situations. 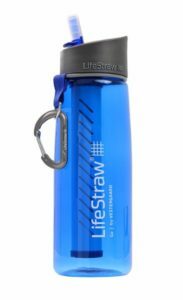 LifeStraw Purification Water Bottle – LifeStraw water bottles remove 99.99% of bacteria to make water safe to drink. The carbon filter reduces odor, chlorine and leaves zero aftertaste. Tip: You can also set up your own sink and faucet with running water. We talk about this in our Kitchen and Bed chapter. Those long drives would be brutal without your favorite drink. Here is a couple of our favorite off the grid coffee makers to help you get to your next destination. 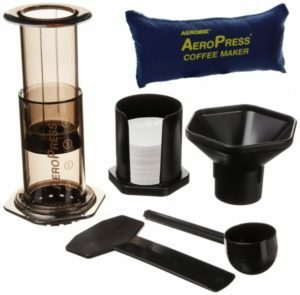 Portable Coffee and Espresso Maker for 1 Person – The AeroPress is both a coffee and espresso maker. It’s super small and easy to carry, which makes it great for van life. 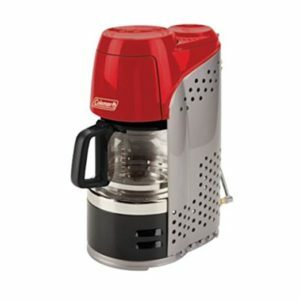 Coleman Propane Coffee Maker for 2+ People – This Coleman coffee maker works incredibly well and can serve up to 10 cups to keep you caffeinated!